The Doctor In The TARDIS > Forum > Travels In Time And Space > The Infinite Quest > Pyramids of Mars > Sutekh! Sutekh, for me, is one of the scariest villains I have seen in the classic run. His voice, lack of movements, the evil of him, it was all really creepy and I loved it. It's another one of the reasons I think this story is so strong. 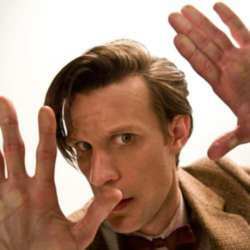 He's just brilliant and definitely someone I think the Doctor should go up against again. He's great - totally over the top, but not unbelievably so. They'd have to get around the fact that he's dead, of course, but I'd love to see him again. Or maybe another evil Osiran. I think it would be good to see him again. He was a bit panto at times, but for me that made him even more fun to watch. He was pretty cool, but I wouldn't be bothered about seeing him again. He's one of those villains, like Omega, that is raved about but I mostly feel 'meh' about them. I remember watching this when I was a kid and Sutekh frightened the life out of me. His voice and that image of him going though the vortex from Mars to Earth creeped me right out. I loved it though!